Offering you a complete choice of products which include rubberised baby mats. 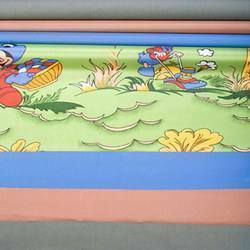 We manufacture rubberised fabrics and rubber sheets without reinforcing fabric for baby mats/diaper changing mats/cot sheets. These are manufactured in baby colours and are printed with colorful shapes and patterns on the sheets. Looking for Baby Mats ?